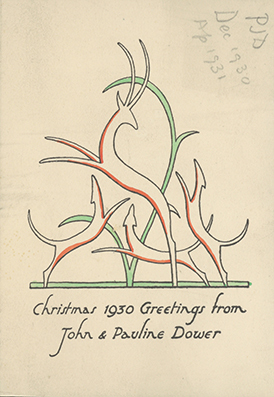 This Christmas Card from John and Pauline Dower was sent in the second year of their marriage, and its clean, uncluttered style reflects the fashion of 1930. This card was likely sent to Pauline’s parents, Charles Philips and Lady Mary Trevelyan of Wallington (find out more about Charles Philips Trevelyan here). The Dowers were both instrumental in the establishment and implementation of National Parks in England and Wales.